Of course no-one knows exactly what Mary and Joseph‘s house in Nazareth was like. The house disappeared many centuries ago. 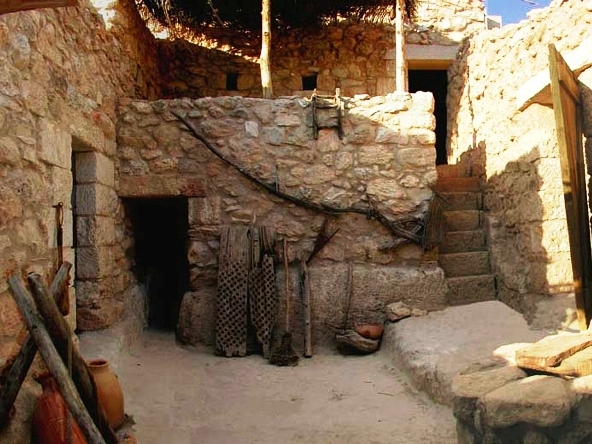 But we do know what ordinary village houses looked like in 1st century Palestine, and in Nazareth in particular. 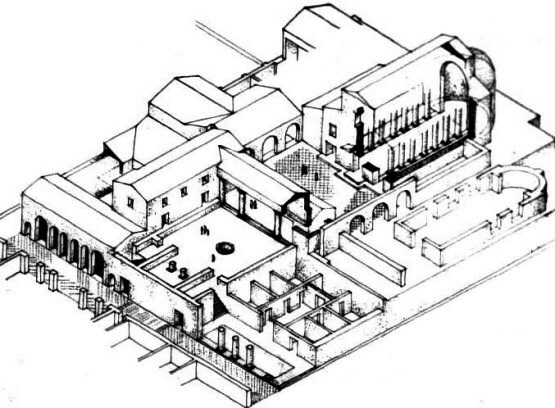 The basic floor plan had a central courtyard with rooms opening off it. 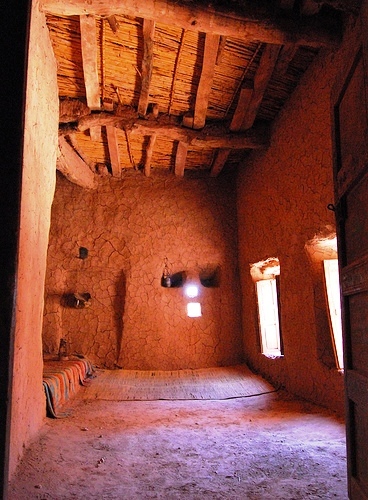 These rooms were small by our standard, with a minimum of windows. Lattice work and shutters were used to cover window openings. Rooms were small. Stairs or a wooden ladder led up onto the roof, which was used as an outdoor room partly shaded by matting or a tent-like superstructure. The inside rooms tended to be dark, so the courtyard and the roof were important parts of the house, used for tasks that needed good light – Mary of Nazareth and the women of her family would have spun yarn, woven fabric and prepared food there. In hot weather family members slept there as well. 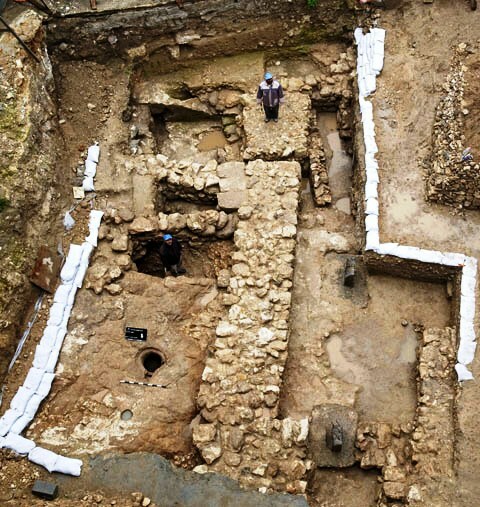 For more pictures and information, go to What Archaeology Tells Us About Nazareth. Most people know Herod the Great as the king who ordered the massacre of the Innocents at the time of Jesus’ birth. But as well as this he was one of the great builders of the ancient world – cities, fortresses, palaces, the Temple. He built on a grand scale. 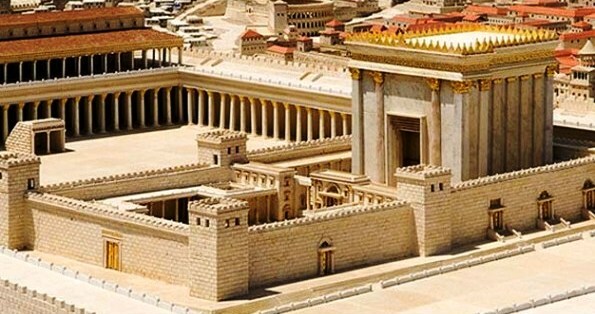 Construction of the Temple in Jerusalem lasted for 46 years. This building was meant to last. 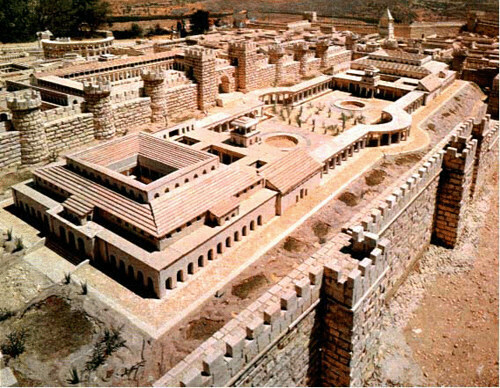 The area of the Temple Mount was doubled and surrounded by a high wall with massive gates. 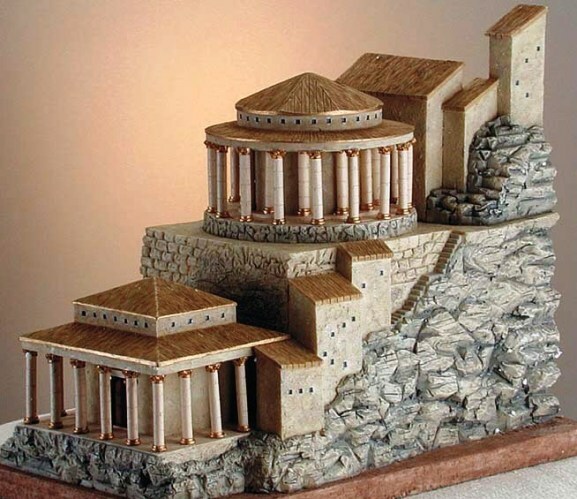 The Temple was raised, enlarged, and faced with beautiful white stone. Its courtyards served as a gathering place and its shaded porticoes sheltered merchants and money changers. A great door led to the sanctuary, at the western end of which was the Holy of Holies. The Temple was not only the center of religious ritual, but the place where the Holy Scriptures and important Jewish literature was kept. 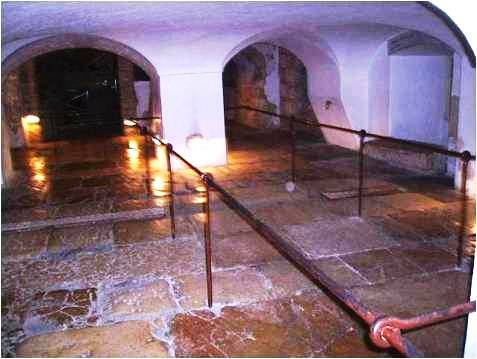 It was the meeting place of the Sanhedrin, the High Court of Jews during the Roman period. 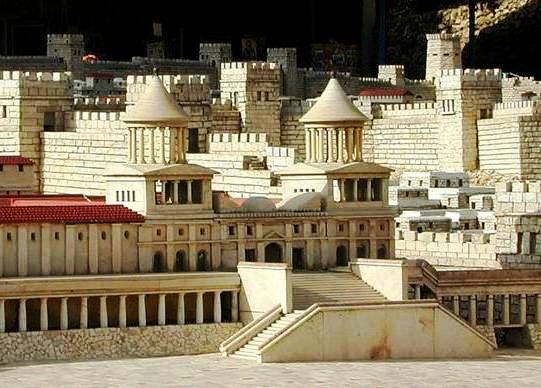 Herod also built a huge administrative sector and a luxurious royal palace (see below), but the Temple was still far and away the most impressive building in 1st century Jerusalem. For more pictures and information, go to Jerusalem Archaeology. 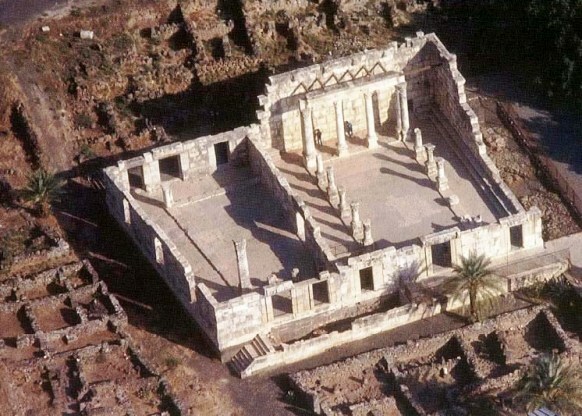 This may have been the house of Annas, a former High Priest who questioned Jesus in Jerusalem the night he was arrested. 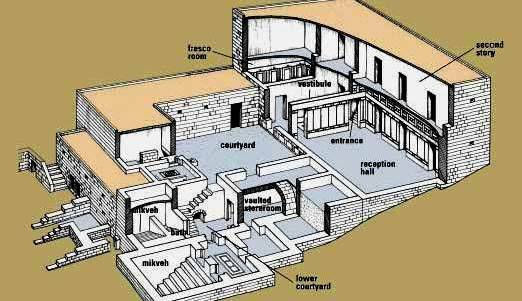 The house must have belonged to someone important and rich, because it is large even though the area it was built in was cramped and short of space. 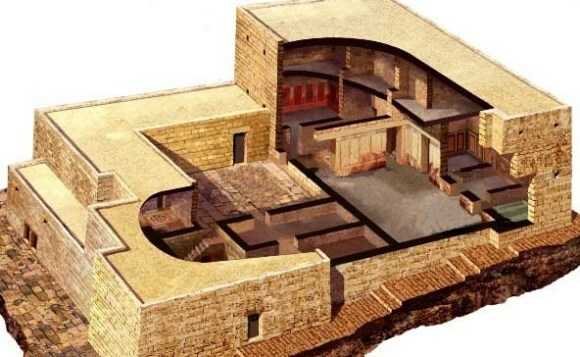 A reconstruction of ‘the Mansion” found in the Upper City of Jerusalem (see quote above). The ruins date from the 70AD, when the buildings were destroyed after the Jewish Revolt. At that time, the whole city was demolished – ‘not one stone standing on another’. 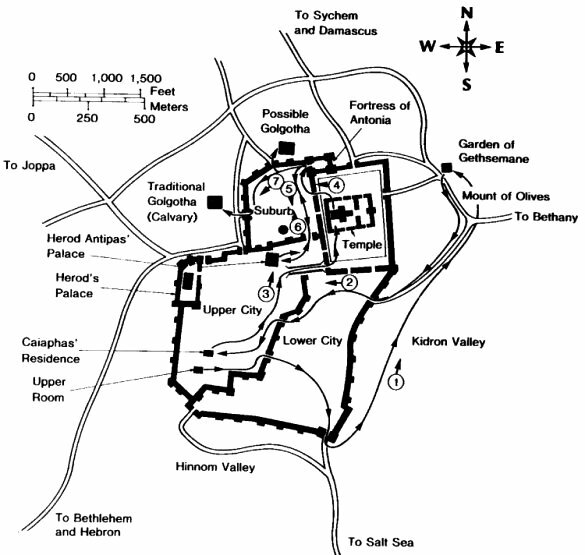 Jerusalem was not the main base of Pontius Pilate, though he visited it frequently. Most of the time he lived in the coastal city Caesarea. When he was in Jerusalem he lived in a section of the royal palace built by King Herod the Great, father of the Herod (Herod Antipas). This was the praetorium, official residence of the Roman governor. After Jesus had been tried by the Jewish Sanhedrin he was bound and led through Jerusalem from the house of Caiaphas, where he had spent the last part of the night, to the praetorium. It would not have been a long walk. Houses of wealthy Jewish citizens like Caiaphas lay close to the Roman administrative centre. The praetorium in the coastal city of Caesarea; the building in Jerusalem was similar. 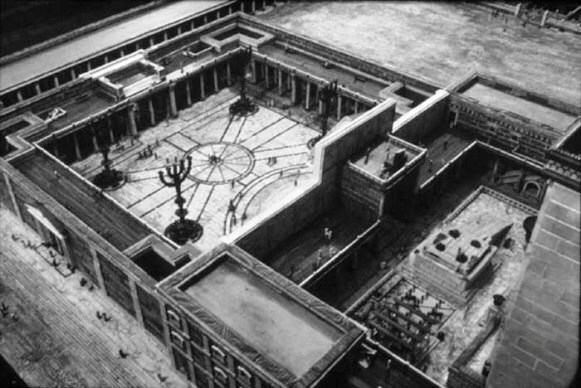 Note the two courtyards at the centre of the buildings. This stone floor is said to be the central courtyard of the Roman praetorium. Jesus may have stood here when he was interrogated by Pontius Pilate. Sepphoris is not mentioned in the Bible, but it was only a good stretch of the leg from Nazareth, and Jesus certainly knew the town. 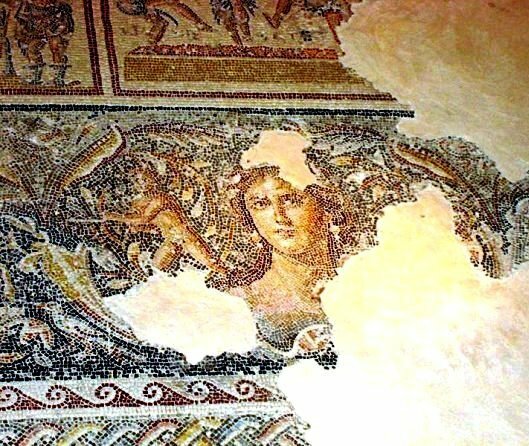 In fact, it is quite probable that Joseph and his young son Jesus worked there – they were builders, and Sepphoris was one of King Herod’s great building projects when Jesus was a boy. 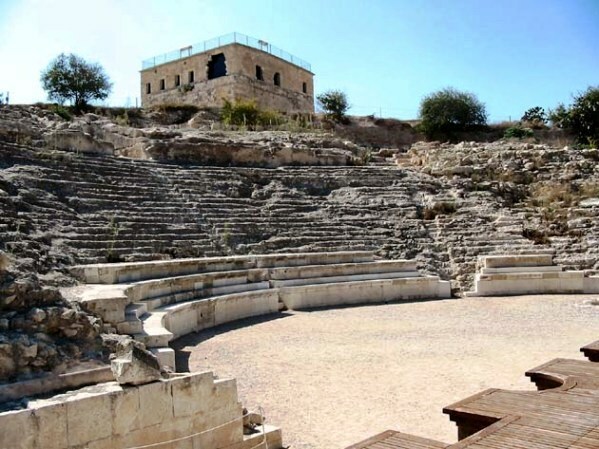 Since Nazareth was only a small village and work would have been limited if not downright scarce, Joseph may have helped build the beautiful theater there, or any of the sophisticated Greek-style buildings and roads. The theater is about 74meters in diameter, with enough seats for 4,500 people. The people who attended this theater were sophisticated, admiring Greek and Roman plays. Traditional, conservative Jews such as Jesus and his family frowned on this, and preferred their own Jewish culture. The white marble synagogue in this photograph is not the one that Jesus taught in, but it was built on top of an earlier one from the first half of the 1st century AD – the one that almost certainly saw Jesus of Nazareth. The original synagogue was of black basalt, with gray marble columns and a cobblestone floor. Jesus performed many miracle in Capernaum, and chose four of his disciples from among its population: Peter, Andrew and the two sons of Zebedee, James and John. Perhaps it was here that the crippled woman was healed by Jesus – the text says he ‘called her over’, presumably from the benches along the wall of the synagogue. Masada is not mentioned in the New Testament, and there is no way of telling whether Jesus ever went there or not. 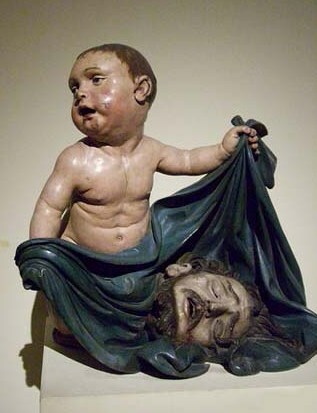 But King Herod, whose hunt for the newborn Messiah ended in the Massacre of the Innocents, certainly did. Paranoid, he transformed the earlier bleak fortress of Masada into an (almost) impregnable bastion – but added an ultra-luxurious palace as well. it a natural fortress. On the northern edge of a steep cliff, it had a splendid view in every direction. No defender would ever by taken by surprise. This northern palace consists of three terraces, luxuriously built, with a narrow, rock-cut staircase connecting them. On the upper terrace, several rooms served as living quarters. In front of them was a semi-circular balcony with two concentric rows of columns. 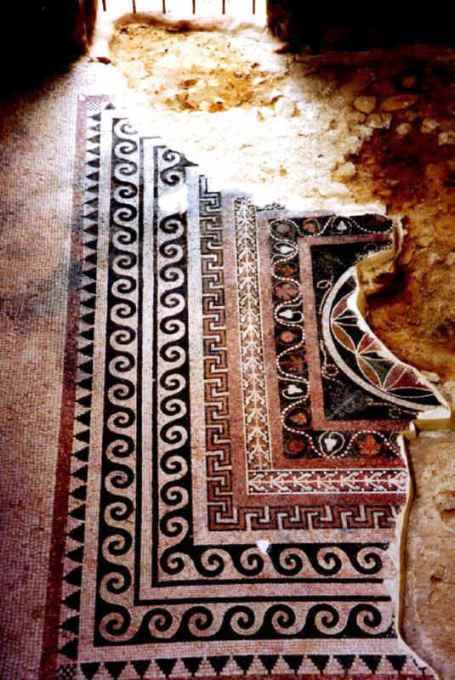 The rooms were paved with black/white and colored mosaics in intricate geometric patterns. (above this image, bottom left of aerial photograph). 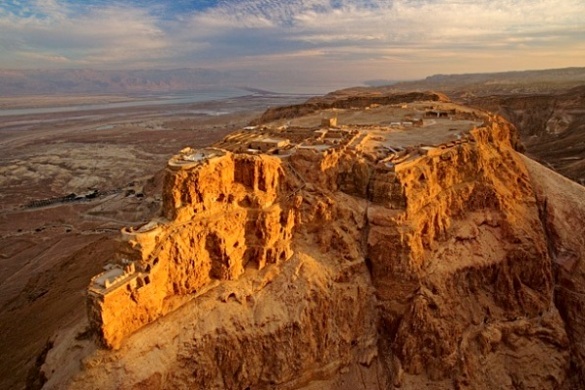 Though it had beautiful palace buildings and luxurious living quarters, Masada was primarily a fortress, built as a refuge in times of danger. This meant it had to withstand a long siege if necessary, with sufficient supplies of food and water for hundreds of people. The water supply at Masada was guaranteed by a network of large, rock-hewn cisterns on the northwestern side of the hill. They filled during the winter with rainwater flowing in streams from the high side of the plateau, and could be relied on to supply all the needs of the people sheltering in the fortress. One of these cisterns is illustrated below. It supplied water for drinking and bathing, and also for irrigating gardens or vegetable plots. 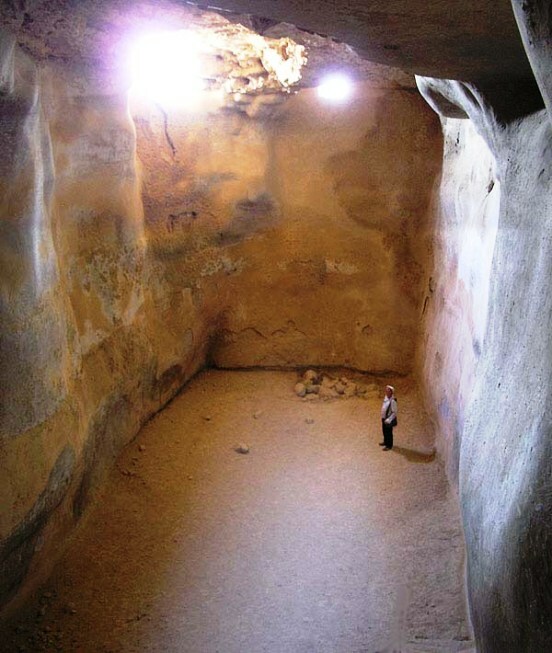 The effectiveness of these cisterns was tested when the Romans laid siege to Masada in 72AD. For two years the defenders of the fortress were able to hold off the attackers, and throughout all this time they were never short of food or water. In the end, they were only defeated when the Romans built a siege ramp and moved a battering ram up to the walls of the fortress, breaching the wall. 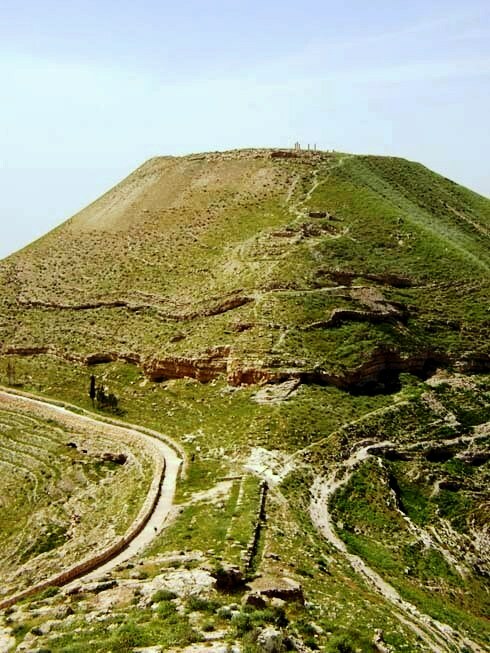 There is no way of knowing whether Jesus ever went to Machaerus, but it certainly had strong associations for him since, according to the Jewish historian Josephus, Machaerus was the place in which John the Baptist was imprisoned and then beheaded (Bellum VII.6.1-2). Jesus was only too aware of this event. Herod was frightened by John’s fearless criticism of him, and of his power to stir people up – as he would later be frightened/intrigued by Jesus. Herod sensed he had met someone he could not control. Putting John into the prison at Machaerus removed John from his followers, and stopped them from communicating with their charismatic leader. It was a forbidding fortress, built to intimidate and control the troubled area between Palestine and Petra. It did its job well. No-one could get in or out of Machaerus without Herod knowing about it. When Herod decided to kill John, the walls of the fortess meant there could be no-one to oppose him. 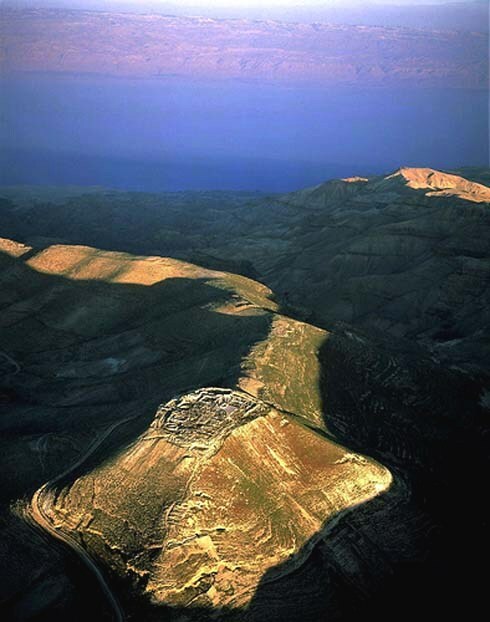 When the Jewish Revolt broke out in 66AD, the rebels holed up within Machaerus’ seemingly impregnable walls. But the Romans built siege works around the base of the fortress and when the lower part of the fortress was captured and burned, the people in the upper city surrendered. You can still see part of the Roman siege ramp on the west side of the mound, and ruins of the Roman camp lie on the hill to the west.